By the time this picture of a Yorkshire Woollen Thames was taken, it was in preservation. Never my favourite Yorkshire coaches, I found them a little slow and a lot noisy. One of them provided the only occasion I experienced where all passengers had to get off and walk up a steep hill which the Ford had failed to climb, though to be fair, the engine had developed a serious defect during the journey. I could never understand why ‘Yorkshire’ bought them – the rumour at the time was that Ford had thrown in a couple of Transit vans for the engineering department but I have no idea whether there was any truth whatsoever in this. As I said elsewhere on this forum recently, there was a time in the early ’60s when these Fords were the (minority) vehicle of choice for major operators requiring a lightweight motor for lightweight (mainly private hire) duties. Although inevitably pressed into service at busy times for front line duties, SUT’s Fords (and the Bedfords acquired with operators) had their own front line duties – Fishing Trips. These were regular Sunday duties. Did it happen elsewhere? Ford only arrived on the scene in 1958, eventually replacing the Commer Avenger as the number two lightweight. Commer withdrew from the market in 1964 – as did Ford much later in 1985. Ford developed a strong fan base as a fast motor – in many ways overtaking Bedford who never quite regained the reputation gained by the OB and SB. The fact that these were inferior offerings to those of AEC, Bristol and Leyland – as well as Daimler and Guy – was immaterial. Quality independents sold their lightweights after about three years to keep a modern profile. The big boys – especially Yelloway – often kept their Bedfords for only one season, ie months, again often renting or leasing where they bought the AECs and Leyland. Interesting comment Neville. I rode on it at the Nocturnal rally at Halifax in October and my thoughts were exactly the same as yours, re the narrowness of the seats. I think the last time I rode on one would be the late sixties, a Bedford version and don’t remember the seats being as tight as on this. Perhaps the Ford version was narrower for some reason. I know the Ford and Commer versions were about 7 inches taller than the Bedford so perhaps they were narrower. There again, I’m afraid I have grown somewhat since the late 60’s! They were only 8′ wide – but that wouldn’t explain why they felt narrower than a (7’6") 1940s half-cab. North Western bought 8 Bedford SB3s for their Altrincham Coachways subsidiary in 1961 with identical bodywork. Five subsequently went to Melba Motors. 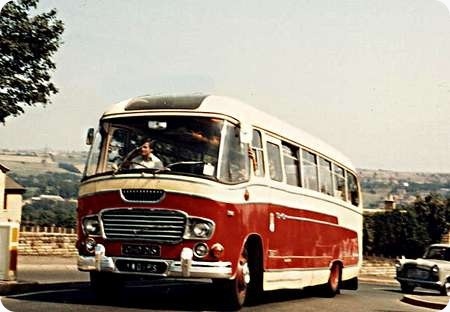 When Altrincham Coachways was sold off and Melba Motors was absorbed into the main fleet, the vehicles were painted red and cream, were given North Western transfers and fleet numbers in the 1967 sequence and were employed for just a season. During their lives they were used on similar operations for the subsidiaries to those where NWRCC employed Tiger Cubs or even Leopards. As far as the infiltration of Fords into the various Bedford dominated Manchester coaching fleets of the period goes this was, as I understand it, due to an aggressive sales policy at a time when the Bedford OB and early 1950s Bedfords were time expired. With both Duple and Plaxton offering bodies on Fords almost identical to those on Bedfords, the price advantage that Ford offered resulted in a good number of orders. A similar Coach to the one illustrated is 525 BGW, which was new to Timpsons. I remember it from when it was owned by J.R.(Bob) Bazeley, an owner driver from Duston Northampton. Owner drivers were my favourite operators. Oh for the 1960s and 1970s, the PSV industry was of interest in those days. The first Ford Transits were built in 1965 so the suggestion that Ford threw in a couple of Transit Vans doesn’t seem to be possible. Like most rumours, it could have been apocryphal, or it might have been the Transit’s attractive predecessor, the Ford Thames 400E van. This old lady brought the A685 to a crawl on the hill up to Kirkby Stephen West at this weekend’s Brough bus rally. Must have been doing around 3 mph. It had the lowbridge Ribble Atlantean panting at its heels, which given that marque’s historical performance on the A591 southwards out of Keswick, is saying something! On Saturday 19/04/14 we had fuel problems due to dragging some dirt out of the tank while going up and down all the hills on the way to Kirkby Stephen I had 2 attempts on service Saturday and gave up but during the evening I managed to clean the filter bowl and make a new seal then on Sunday it ran ok back to going up between Kirkby Stephen East and West stations in second gear. Sheffield buses seem to have a very keen following on the site, so this ex-pat in disguise may be of interest. Around 1970/71 Yorkshire Woollen District were experiencing acute maintenance problems resulting in severe vehicle shortages, and a number of most unlikely temporary second-hand acquisitions appeared on the Dewsbury scene. These included Bristol K’s from West Yorkshire, KSW’s from United, AEC Bridgmasters from South Wales and PD2’s, Atlanteans and Leopards from Sheffield. 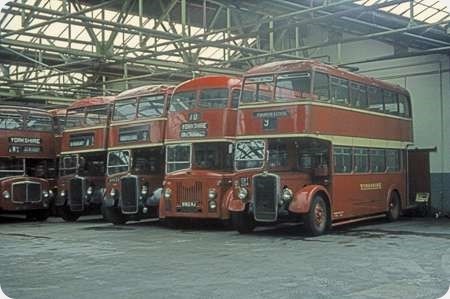 One of these was 3156 WE, which had been new to the Sheffield ‘C’ fleet as their 1156 in 1958. With the takeover of the wholly owned British Railways ‘C’ Fleet by the National Bus Company it passed to YWD as their 135 in 1970, in which form it is seen here at Savile Town garage in late June 1971. Renumbered 466 in 1971 it was withdrawn in 1972. Sold to North’s, the dealer, of Sherburn-in-Elmet in early 1973, they quickly sold it to Don’s of Dunmow, Essex. It was later secured for preservation and by 1997 was owned by First Mainline forming part of their heritage collection – even receiving group fleet number 30386 ! It is now part of the South Yorkshire Transport Museum collection. This Sheffield exile in the south has only been on 1156 once in preservation, a couple of years ago, but she was rather fine on that occasion – taking a full load from Meadowhall to the museum in Rotherham. I did not make any notes at the time, but it certainly would be another like 135. YWD had 135-140 (3156-3161 WE), and 141 (6162 WJ), as well as two ECW-bodied PD2’s, 142/143 (YWB 152/153). I remember an occasion when a defect affected a Sheffield J.O.C Leyland Atlantean on the joint service 66 Sheffield to Bradford service whilst it was passing through Heckmondwike. 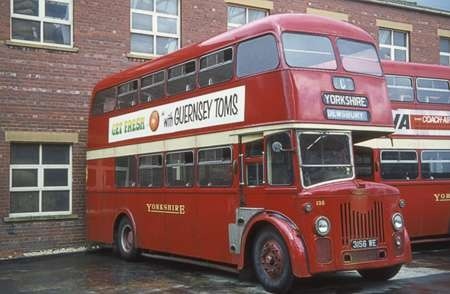 Yorkshire Woollen supplied a change over in the guise of one of their former buses from the Roe bodied batch. This particular vehicle didn’t seem to stay with Yorkshire Woollen very long following it’s full repaint. At fourteen years it wasn’t exactly an old bus, had YWD’s difficulties eased by 1972 or did they just run these until the COF’s expired? In August 1971 YWD undertook a major service revision (reduction) and a major extension of OMO which saw off most of the ex Sheffield buses. When I worked at Frost Hill in the Hebble coaching unit summer 1972 I would travel home to Bradford on one of the last few of these regularly, but as we took delivery of the K registered Leopards and Fleetlines, all the half cabs except the Lowlanders, PD3’s and converted PS2’s were withdrawn. 135 is blinded for route "C", Ravensthorpe-Dewsbury-Ossett. This route, together with "B" (which avoided Earlsheaton between Dewsbury and Ossett), became routes 46/47 under the August 1971 revisions referred to by Ken, when the ex-tramway routes became numbered instead of lettered. At the same time YWD vacated its Frost Hill, Liversedge, Depot into which Hebble – now the coach unit of the "West Riding Group" – then moved.